Who says everything can’t be happiness and rainbows? 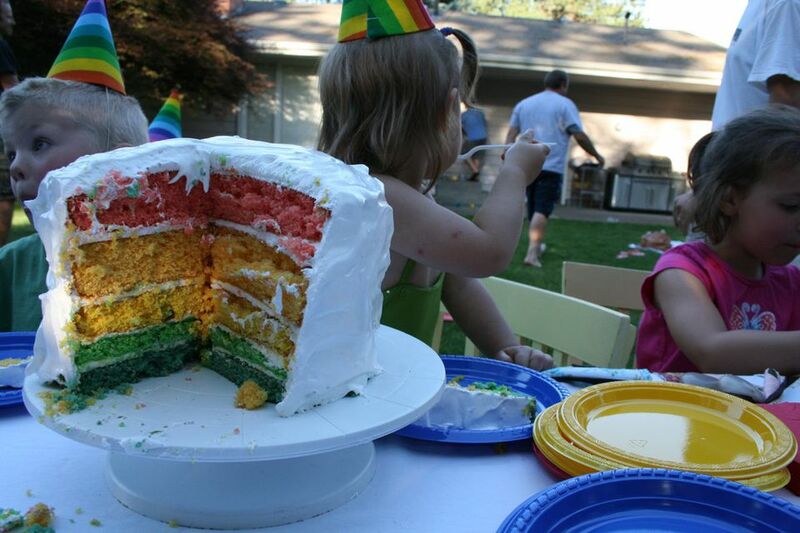 At a rainbow-themed birthday party, these games are sure to deliver just that. Make two large cardboard cutouts in the size of a rainbow and draw lines to divide the sections where the colors should be. Hang them side-by-side on a wall. Place a roll of tape near each rainbow board. Divide the players into two teams. Give each team a roll of streamers in every color. On “go,” the first players in line will grab one roll of streamers, and let it unroll behind her as she races to the rainbow board. When she is there, she must rewind the paper into a roll before the next player can grab another color of streamers and do the same. Once all of the colors have been re-rolled back at the rainbow boards, teams can start using the streamers to fill in the spaces with colors. The first team to color in its rainbow is the winner. Blow up one a few balloons in each color of the rainbow and scatter them around the room. Place a hula hoop on the floor. One at a time, give a player a broom and one minute to sweep all of the colors of the rainbow into the hoop. When time is up, all seven colors of balloons should be inside of the hoop. If they are not, the child is either out of the game or has to go to the back of the line to wait for another turn. To play this game, you will need two bowls of small, colorful candy (such as skittles, m&ms or jelly beans). Place the two bowls of candy on one side of the room. Place two empty bowls on the other side of the room. Divide guests into two teams. Give each team a spoon. The object of this game is for players to use the spoon to transfer the rainbow candy from the full bowl to the empty one. This is done by teammates in relay-race-style, and the first team to move all of their candy wins the game. Another fun relay race, this one requires each player to dress up in the colors of the rainbow. To set up for this game, you will need two identical sets of rainbow-colored clothing. You can look for clothes that are in rainbow patterns, or use the different colors for the different articles of clothing. For instance, a red hat, an orange shirt, a yellow scarf, a pair of blue pants, a green belt and one indigo and one violet sock. Make sure the clothing you select is large enough to fit over the players’ regular clothing. Divide players into two teams, and have them line up at the starting point. Give each team a set of rainbow clothing. The first player in line has to put on all of the clothing, run to a designated turnaround spot, come back to her team, remove the clothes and hand them to the next player. Every player must take a turn doing this until one team completes the race first. To play this game, paint seven empty, plastic bottles in the seven colors of the rainbow. Another idea is to fill them with layers of colored sand. Set them up like bowling pins. Use a rainbow-colored rubber ball as the bowling ball. Have kids line up and see how many rainbow pins they can knock over with the ball.